Derek Carr proved his MVP status to The Raiders simply by being absent. Derek Carr has cemented his MVP status within the Raiders organisation simply by being injured. And despite not being in anyone’s predictions as NFL Most Valuable Player of the year for the 2016 season, he has to be considered. When assessing MVP, the NFL needs to look a little further than straight out team success. We are talking individual’s worth. Just how valuable is the player to the team? Well, without a doubt, a Derek Carr-less raiders have struggled enormously. First, when he dislocated his finger, the Silver and Black’s struggled to make much headway with McGloin under centre. Fortunately, Carr had done enough in that game for the Raiders to hang on to the win. 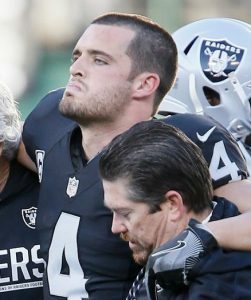 But when Carr broke his fibula late into the Colts game on Christmas Eve, many people feared that was the end of The Raiders chances in the playoffs. That fear, in itself, was an indicator of just how valuable Derek is to the Raiders. Sure enough, we all saw what happened. The wheels came off the team, losing out to the Chiefs, thus losing home advantage (if indeed, it would have been an advantage) and more importantly a week off in which the third-string QB could have got some valuable first team practice time, and then putting in a depressing effort against the Texans. In Houston, Conner Cook threw 18 of 45 for 161yds. It’s a tough ask against one of the NFLs best defences, but compare that to Carr’s figures throwing 21 of 31 for 295yds when he took on the Texans in Mexico City. When Prescott is missing from the Cowboys line-up, they don’t fall apart. Same with Rodgers at Green Bay. Tom Brady’s pedigree isn’t in doubt and a 28-2, TD to interception ratio is record breaking, but the Pats are an overall quality team. So vegas-raiders.net presents you with the Most Valuable Player of 2016: Derek Carr.